Boeuf Bourguignon (BEUF boor-gee-NYON), or Beef Burgundy, is a bistro dish that can’t be missed. And while it sounds fancy, it’s not. It’s just beef stewed in red wine with bacon, onions, and mushrooms. 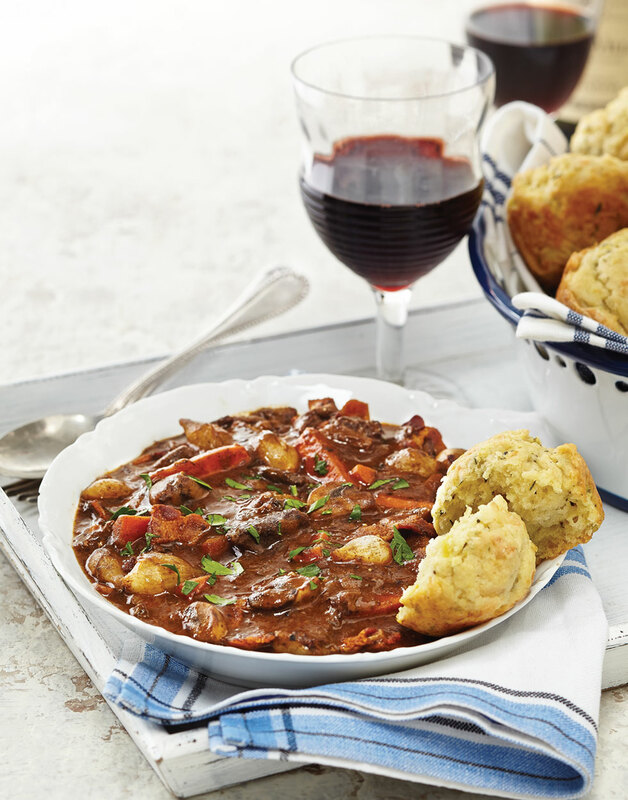 But it is the most delicious beef stew, especially because in this version, porcini mushrooms give extra depth of flavor to the irresistibly rich and hearty classic. Warm and satisfying, this meal will transport you right to a sidewalk café, from the comfort of your home. Soak porcini mushrooms in hot water 30 minutes; strain, reserve liquid, and chop mushrooms. Cook bacon in a large pot until crisp; transfer to a paper-towel-lined plate. Pour off and reserve &frac13; cup drippings. Toss beef with &frac13; cup flour to coat. Brown beef in same pot, in two batches, in 2 Tbsp. drippings per batch, over medium heat; transfer to a plate. Sauté diced onion and minced carrot in same pot in 1 Tbsp. drippings over medium-high heat until soft, 3–5 minutes. Add tomato paste, thyme, garlic, rosemary, and bay leaf; cook until fragrant, about 1 minute. Stir in 1 Tbsp. flour; cook 1 minute. Deglaze pot with wine, ¾ cup broth, and reserved porcini liquid, scraping up any brown bits. Return beef to pot; add porcini mushrooms and carrot pieces. Bring stew to a boil, then cover and transfer pot to oven; cook until beef is nearly fork-tender, 1–1¼ hours. Melt butter in a sauté pan over medium heat. Add button mushrooms and cook until brown and liquid nearly evaporates, about 10 minutes. Stir in remaining 1 Tbsp. flour; cook 1 minute. Deglaze pan with brandy; cook until nearly evaporated. Add pearl onions and remaining ¼ cup broth; scrape down sides of pan, then add button mushroom mixture to stew. Return stew to oven and cook, covered, until beef is fork-tender, 30 minutes more. Degrease stew with a spoon; stir in vinegar and bacon and season with salt and pepper. Top servings with parsley. For optimal flavor, reserve the porcini soaking liquid. Add it to the stew with the wine and beef broth. You’ll need a whole bottle of wine to ensure the beef is covered. This way the beef won’t dry out, plus the wine adds flavor. Once mushrooms are brown and “dry,” deglaze with brandy. It adds rich smokiness to the stew.